Falassarna is a small village at the west coast of Crete which has one of the most famous beaches in Chania area. Crystal clear blue waters, a submerged ancient city, cyclopean walls, a stone throne of unknown time and origin, Crete in all its splendour. 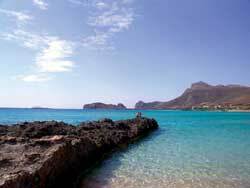 Falassarna beach, has joined the project Natura 2000, because of its outstanding natural beauty and the variety of flora and fauna in the area.